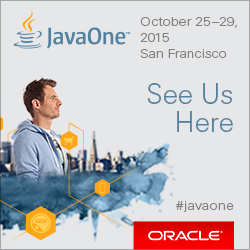 For the sixth year in a row, Qoppa Software will be exhibiting at JavaOne in San Francisco, October 25-29. The theme for this year’s Oracle event “1995-2015: 20 years of Innovation” echoes Qoppa’s long-term commitment in delivering relevant PDF technology to help businesses of all size implement efficient, ingenuous document workflow processes. Gerald Holmann, president and founder of Qoppa Software, will be at the booth to answer any questions from Java developers, and to discuss development and deployment scenarios. Friends of Qoppa, i.e. existing and potential customers and partners, may claim one of Qoppa’s Discover Passes, which offer access to five days of conference keynotes and the exhibition halls. More information on Discover Passes can be found on Oracle’s website. Qoppa Software’s booth #5007 is located in the JavaOne Exhibition Hall, at the Grand Ballroom of the Hilton Hotel. To schedule a meeting time with Qoppa’s president Gerald Holmann or to claim a Discover Pass to the events, email Leila at leila@qoppa.com. Visit Qoppa Software at JavaOne 2012 and win a Nexus7! This entry was posted in Java PDF Library, Qoppa Software Events and tagged JavaOne on September 8, 2015 by qoppacom.